December 10, 2017, Mumbai, Maharashtra, India – After driving to the Somaiya Vidyavihar, in the central suburbs of Mumbai, for the third consecutive morning, His Holiness the Dalai Lama was first requested to unveil a statue of Dr Shantilal Somaiya, father of the current President, Samir Somaiya and son of the founder. In the presence of close family members he inaugurated the seated image. He was then escorted to the daïs under an extensive awning where he was to give a talk to an estimated 2000 people. He was ceremonially welcomed by Namrata Mahabal, took his seat and began. “Dear respected elder brothers and sisters, as well as younger brothers and sisters. I like to start in this way because I believe that all 7 billion human beings alive today are our brothers and sisters—all of them deserve our love and compassion. “Just now we’re enjoying ourselves peacefully here, but elsewhere on this very planet other people like us are dying violently and children are starving to death. Natural disasters are beyond our control, but there are problems created by human beings that we have a responsibility to resolve. They come about because we are swayed by destructive emotions. “Whoever I meet I think of as a fellow brother or sister. If, instead of thinking of others in terms of ‘us’ and ‘them’, we cultivate a warm-hearted concern for them it brings about a self-confidence that prompts the kind of transparency that leads to trust. Trust in turn is the basis for friendship—genuine, reliable friendship that remains firm whatever happens. “Scientists have conducted experiments that show that injured animals recover more quickly when they have caring companions than when they are alone. Companionship and concern for others provides a peace of mind that we can depend on when we face difficulties. When we’re disturbed by anger or attachment it’s difficult to use our intelligence clearly. This is important because adopting an unrealistic approach fails to lead to success. 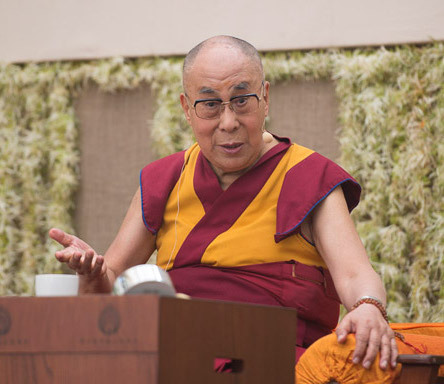 His Holiness explained that his understanding of how to tackle destructive emotions dates back to the ancient Indian knowledge, particularly Buddhist traditions, that the Nalanda Master, Shantarakshita introduced to Tibet in the 8th century. 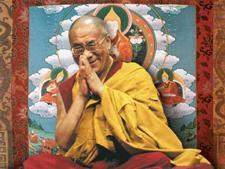 Tibetans have kept this knowledge alive through study and practice for more than a thousand years. He remarked that the Indian traditions of karuna and ahimsa, compassion and non-violence, as part of the message of the Buddha extended across Asia over the last 2000 years. “I believe we need to combine modern education with the insights of ancient Indian knowledge. I believe that understanding the workings of the mind and emotions is very relevant in today’s world. That’s why I am committed to reviving this ancient knowledge in this country. “I describe myself as a ‘son of India’ because every cell of my brain has been filled with Nalanda thought, while, for the last 58 years my body has been nourished by Indian rice, dal and chapatis. What’s more, I admire the rich diversity that thrives in this country and the stability of India’s religious harmony. “At the same time I’m careful not to propagate Buddhist teaching in the West, for example, where they have a largely Judeo-Christian tradition. While I admire the work Christians have done across the world to further education, sometimes, as I have seen in Mongolia, they also engage in missionary activity, seeking converts to Christianity, which I don’t approve of. In his responses to questions from the audience His Holiness reiterated that basic human nature is compassionate. This is why if your neighbour’s house is on fire you help him put it out. He mentioned that too much energy and resources are presently directed to the production and sale of weapons. His Holiness returned to the theme of religious harmony and how he admires the way India demonstrates that it something we can achieve. He reported he has repeatedly urged the Government of India to hold an international religious conference along the lines of the Buddha Jayanti that was launched in 1956. After due deliberations among delegates, he would like to see them make pilgrimages to each others’ places of worship. Responding to question about the difference between atman and Buddha nature, His Holiness recalled a conversation he had with a good Swami in Bengaluru. They agreed that Hindu and Buddhist tradition have the practice of ethics, concentration and wisdom in common, which makes the two traditions like twin brothers. He suggested that while the Swami found the idea of atman useful to him, His Holiness finds the idea of anatman more useful to him. However, which they choose is their own private business. He advised that just as some people prefer sweets while others prefer savoury snacks—there’s no point in arguing about it. His Holiness concluded his talk by thanking Veer Singh and Samir Somaiya for organizing the three day event. Samir Somaiya in turn thanked him for coming. Maneesha Abhay and her group offered a traditional Indian dance performance dedicated to Avalokiteshvara before His Holiness left for his hotel. Tomorrow he will travel to the Tibetan settlement of Mundgod in Karnataka.